According to which formula or calculation method, in the program module Steel EC3, the rotational bed rigidity in the case of a non-continuous rotary bedding (eg. B. Purlins)? The total torsion spring consists of several individual torsion springs, which are given in equation  as equation 10.11. 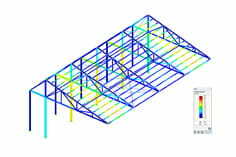 In a non-continuous bedding by purlins in STAHL EC3 the rotary bedding from the connection stiffness C D, A , the rotary bedding C D, C from the bending stiffness of the resting purlins, as well as when activating the bedding C D, B from profile deformation are considered. Since the execution of the connection is unknown, an infinite value is set here by default. The spring stiffnesses are taken into account as reciprocal 1 / C, thus giving "infinite" a spring stiffness = 0. If the user knows the torsional stiffness of the connection, he can enter this value manually. In the attached example there are two STEEL EC3 cases.